This is my brother. Ok, in RL I don’t have a brother but in SL, I have someone who functions as one. Not in that sticky icky hearts and flowers in my profile way. More like that annoying IM me with foolishness and stupid names like “smeg” and “fart blossom.” The one who will trash me one minute and go after anyone who looks at me funny the next. There is, of course, constant bickering and arguments about who is to do what and when. Like shoveling. Of course, my brother needs to be the one who has to go out to do the shoveling. It’s only fair. 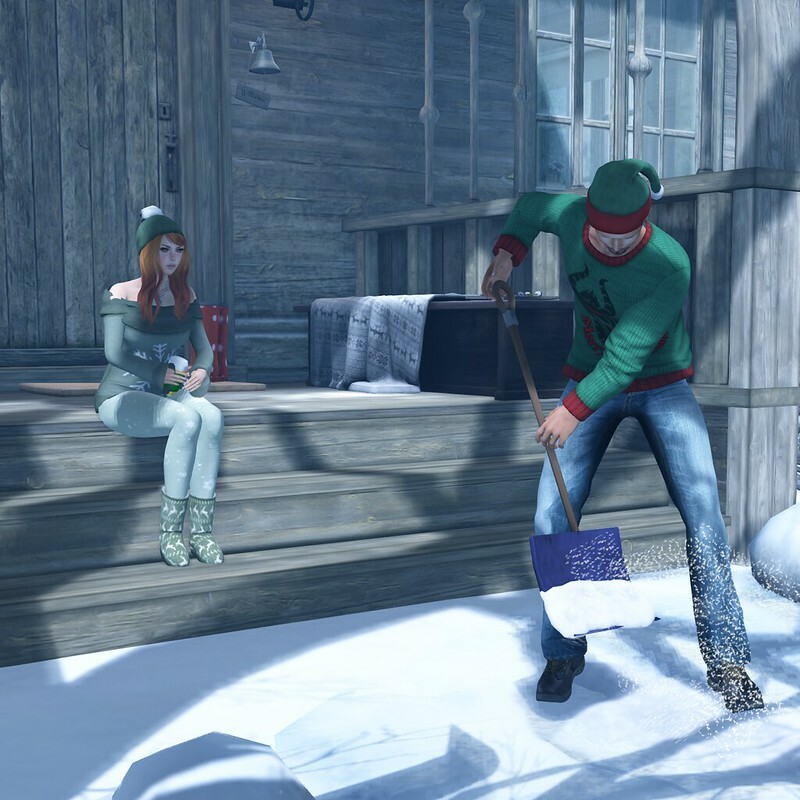 The pose set from Kay Weston for FROST is more ideally fitted to him (*cough* no one needs to tell him the shovel position can be modifed). And of course I can sit by sipping my hot cocoa and watching and tell him where he’s missed a spot. It’s the natural order of things. 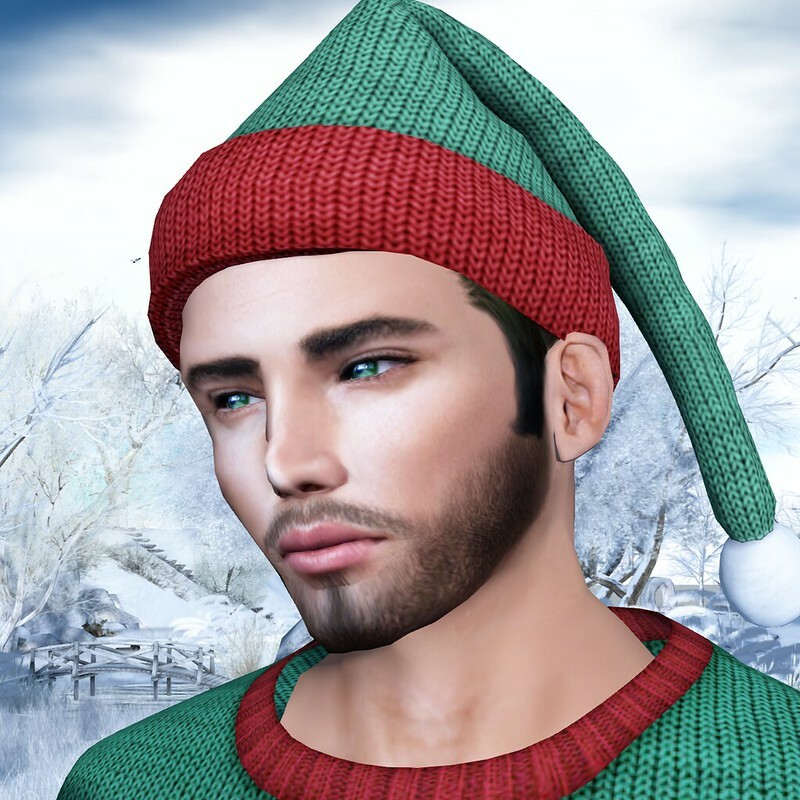 My brother is wearing today’s KittyCats & Friends Advent Calendar gift, a beard from ReishiProphet, available in two styles and several hair colors including a tintable beard. (I tried making it green but, yeah, don’t go there.) 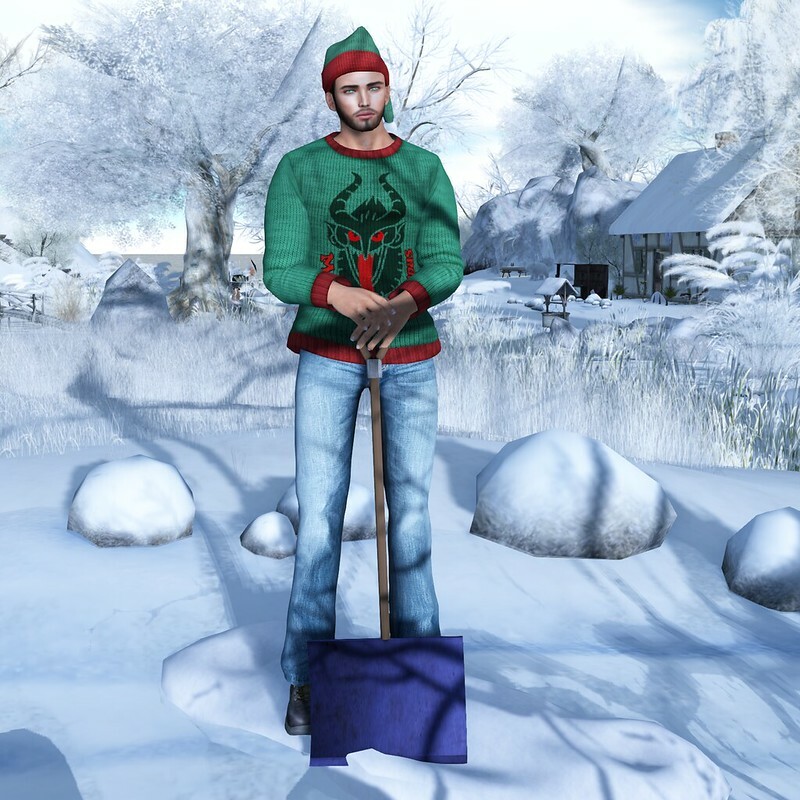 This is a tattoo layer and is a gift for MEN, who seem to get short shrift in the gift department in SL during the holidays. 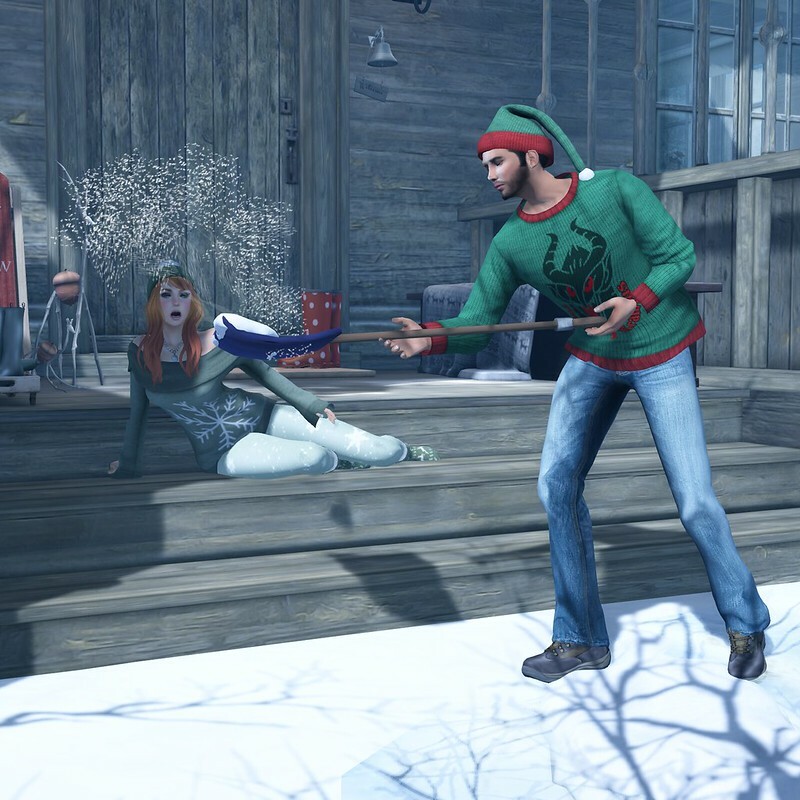 He is wearing it over the Emerson skin from ReishiProphet but it can be worn with any skin and look just as awesome. I am sporting Lara Hurley’s lovely new skin with an included winter blush, which is just lovely. I love the brows, lips, eyes. Well I love it all and it’s fantastic on my system shape. Bubbles Clawtooth is featuring two hairs with texture-change hats at Collabor88 with winsome hair styles. Please note brother and sister have the same eyes from Constance Daehlile. We got them from our dad. Fall has come in too quickly. I am still staring at the shorts and t-shirt in my drawers, wondering if I will ever be able to wear them again. It’s not so bad because fall brings back the best part–snuggling up. So I have snuggled up to .. myself. Yeah, that’s my male alt modeling for me. I needed a hunk in a pinch and there he was, chilling in his box, so I pulled him out. (Yeah, really, what kind of loser snuggles their other doll except me?) The reason was this adorable seasonable skybox from Gin Galtier. She has made 50 only to be sold on Marketplace and for that alone, it’s worth considering. I don’t normally do “on location” shoots, but the colors in this skybox are so pretty and autumnal, I wanted to show something cozy. Check out the sweet desk in the corner with Gin’s eclectic styling. The skybox comes complete with all decor, which is also modifiable and removable. So you can hack this skybox as you please and still have a cozy nook for warming up. At 215 prims, it’s a lightweight packed with a lot of goodness.